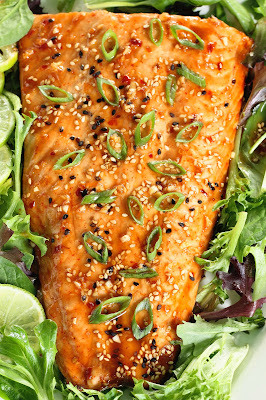 Ready in under half an hour, then nestled in a sea of edible greens, here's a melt-in-your-mouth salmon dish with plenty to serve for a buffet ~ or, to have cold leftovers the next day! 1. Cover the bottom and sides of a baking pan with foil. Very lightly oil the foil. Place the salmon in the pan, and lightly sprinkle with salt. 2. Whisk together the ingredients for the sauce. Brush 1/3 of the sauce over the top of the salmon. 3. Bake the salmon for 10 minutes. Remove from the oven and brush the salmon with 1/2 of the remaining sauce. Bake for another 2-5 minutes until the salmon is cooked through, and has an internal temperature of 145 degrees F.
4. Remove from the oven, and place the fish on a serving plate with the edible mixed greens. Cover the salmon with the remaining sauce. Sprinkle desired toppings over the salmon. Serve. Recipe adapted from www.foxandbriar.com website.